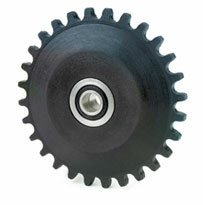 CONDITIONS: Bearings were located deep within the equipment and could not be externally lubricated. Bearing life was 6 months. CONDITIONS: During the sizing operation, salt and other seasonings are added. These solid particulates contaminated the bearings, causing bearing failure in 6-8 weeks. Downtime costs customer $25,000 per hour. CONDITIONS: Coal dust caused bearing seizure, resulting in the dust being ignited. Bearing life was 9 months. How can MicroPoly help your business? We have the technology and proprietary products to solve your difficult applications. 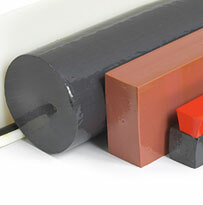 MicroPoly lubricants are available in a variety of formulations to meet specific application requirements, such as, higher temperatures and speeds and food processing applications. 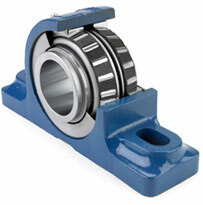 They are field-proven to make bearings last longer by reducing the infiltration of dirt and other contamination. The advanced lubrication technology contributes to lower maintenance and associated costs, thus channeling saved dollars to your bottom line. 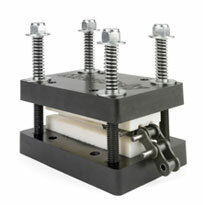 This applicator employs grooved blocks of MicroPoly to lubricate chains. 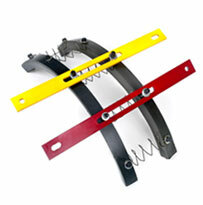 The revolutionary MicroPoly lube arcs dramatically reduce wear on overhead crane wheel flanges. MicroPoly lubricants are solid, and can be processed into a variety of shapes with various polymer processing techniques.